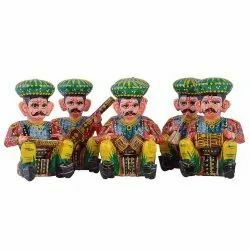 Manufacturer of a wide range of products which include wooden rajasthani musician (6 pcs set). Wooden Rajasthani Musicians 6 Pcs Set. Great art and carving gives it a amazing and beautiful look that will add great look in your home.This model is best for home decoration and best gift for various occasions. Jaipur Ace thankful for such valuable customer. Thanks for selecting the product of our artician. Looking for Rajasthani Wooden Musician ? Copper Water Bottle 1000 Ml. Copper Water Bottle Matt 1000 Ml.